Eric Grenier’s Ontario Seat Projection of May 23, 2014 including polling in the field to May 21, 2014. 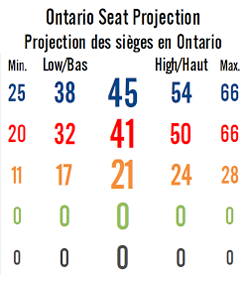 (1) Contemplating Eric Grenier’s latest 2014 Ontario election seat projection can be a sobering and/or even alarming experience : Conservatives 45, Liberals, 41, New Democrats 21. 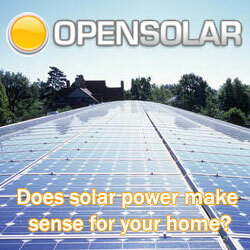 Can this kind of situation prove remotely stable? Note, eg, that even a bare majority in the current 107-seat Ontario Legislative Assembly is 54 seats. So … could Tim Hudak climb down abjectly from his current over-aggressive “conservative” rhetoric, and work with one or other of the two more “progressive” parties long enough to pass even one budget? Or could the Liberals and NDP join together in a written Accord, reminiscent of the fabled Ontario Liberal-NDP Accord of 1985–1987, and keep Premier Kathleen Wynne in office for at least two more years? Or will we just have to have yet another election in the fall, or early winter ???? 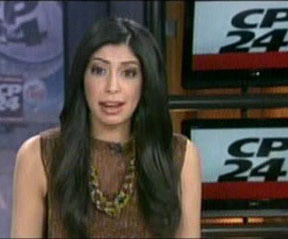 Pooja Handa, cp24 princess. Back in the good old days? 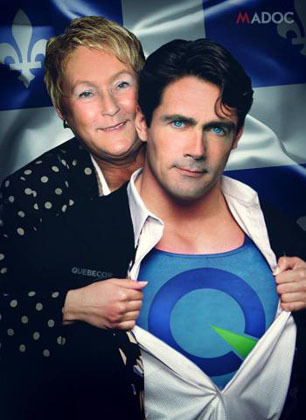 On some similar channel, btw, the conservative mood in Southern Ontario beyond the biggest cities may have something to do with the extent to which many old Ontario regional daily newspapers have now been taken over by Sun Media — ultimately owned by Quebecor and the arch-conservative Quebec sovereigntist (and now unfortunately injured) Pierre Karl Peladeau. Here is what would appear to be the current honour roll : the Barrie Examiner, Belleville Intelligencer, Brantford Expositor, Brockville Recorder & Times, Chatham Daily News, Cornwall Standard Freeholder, Kingston Whig-Standard, London Free Press, Niagara Falls Review, North Bay Nugget, Northumberland Today, Orillia Packet And Times, Owen Sound Sun Times, Pembroke Daily Observer, Peterborough Examiner, Sarnia Observer, Sault Star, Simcoe Reformer, St. Catharines Standard, St. Thomas Times-Journal, Stratford Beacon Herald, Sudbury Star, Timmins Daily Press, Welland Tribune, and Woodstock Sentinel Review. Jack Nicholson and Karen Black in Five Easy Pieces, 1970. 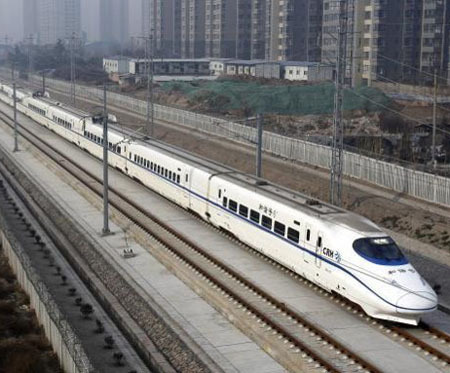 A bullet train on the Xi'an-Baoji High Speed Railway, in northwest China (Xinhua/Jiao Hongtao). (4) Some will be astounded to hear that Rob Ford has recently been a topic of discussion at the Woodrow Wilson International Center for Scholars in Washington, DC. A session at the Center last Friday, on “The Rob Ford Phenomenon: What’s going on in Toronto?”, was led by Anne Golden, a former president of the Conference Board of Canada, and frequent student of various Greater Toronto Area issues, going back a long time (and unmistakably one of the “elite” whose rule Ford Nation is reacting against, as Ms Golden aptly pointed out). 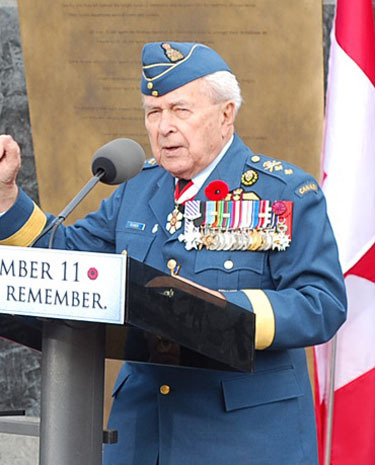 Retired Major-General Richard Rohmer addresses Toronto Remembrance Day ceremony in 2009. Old soldiers never etc, etc, etc. 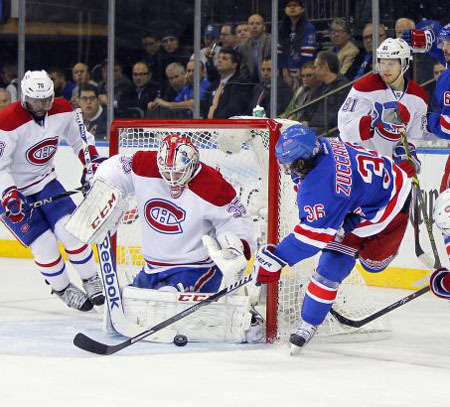 The Habs at Madison Square Garden on Thursday. And then of course we have the Montreal Canadiens, bearers of the last Canadian hopes for the Stanley Cup this year. Kudos to the Habs (short for les habitants) as “Alex Galchenyuk’s overtime goal gives Montreal new life in Eastern Conference final.” (Even if it is also true that “New York was largely the better team — in the way Montreal was in game two — and the Habs must ramp up their game to nourish the tiny flicker of hope created in game three.” Game four will be held this Sunday, May 25 at Madison Square Garden in New York City, 8 PM ET. And we will be holding a big party here on the east-end waterfront of the Big Smoke, to send some warlike pro-Canadien vibes across Lake Ontario and into the Mohawk Valley, across to Albany-Rensselaer, and then down the Hudson River to Manhattan, at the corner of 8th Avenue and W 33rd Street (or is that W 31st ????). Hey, why not get really crazy on this beautiful spring weekend in the Northern Uprising — Go Habs Go!